Israel Horowitz, a very prolific writer with more than 70 plays to his credit, has the distinction of being the most produced American playwright in French theater history. 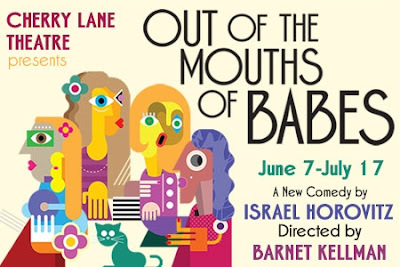 Appropriately enough, his latest play, Out of the Mouths of Babes, currently premiering at the Cherry Lane Theatre in Greenwich Village, is set in a Paris loft where four women meet to pay their last respects to the recently deceased centenarian professor whom they all loved at some time in their respective lives, and who, in turn, loved all of them at some time in his own. Estelle Parsons is perfectly cast as Evelyn, the 88 year old grand dame of the group and one of the deceased professor’s oldest and earliest wives who shared his bed back in the Big Band era of the1940’s. Judith Ivey is equally well cast as Evvie, twenty years Evelyn’s junior, and the only one of the four who never married him (by her choice, not his, as she remained his lover in the hipper 1960’s when their music centered on the Beatles and their ilk rather than Frank Sinatra and Ella Fitzgerald). Janice (Angelina Fiorellisi), the craziest and most self-destructive of the lot, was younger still and arrived on the scene later, but she did succeed in teaching him to play Chopin’s Etudes (which does come in surprisingly handy as the play approaches its close). Finally, Marie-Belle (Francesca Choy-Kee), young enough to be his granddaughter and the last of his many wives, turns out to have been the prime motivator in bringing the four women together for his funeral. And it is she who really animates the entire production with her unbridled enthusiasm. This is not a deep or thought-provoking play and you’re unlikely to spend much time pondering its nuances. But it is nonetheless very entertaining, due to the exceptional performances of all four of these very talented actresses as they reminisce on the lives they led. L-R: Evelyn Hoskins and Richard Stacey in HERO'S WELCOME. Photo by Tony Bartholomew. Alan Ayckbourn’s Confusions was first produced in Scarborough in 1974 and had its London premiere in 1976 but we still had to wait another 40 years before it finally came to NY. On the other hand, Hero’s Welcome, Ayckbourn’s newest play (his 79th in case you’re counting) premiered in Scarborough just last year and, fortunately, we haven’t had to wait nearly as long for this one to open here. The two plays – Confusions and Hero’s Welcome - are currently playing in repertory at 59E59 Theatres on East 59th Street in midtown Manhattan. We reviewed Confusions (which we very much enjoyed) in our last post. Now here’s our bottom line on Hero’s Welcome: we loved it and it’s clearly another Ayckbourn hit. The hero of Hero’s Welcome is Murray (Richard Stacey) a decorated soldier returning after 17 years to his old home town of Hadforth with Baba (Evelyn Hoskins), his foreign-born bride. When Murray left Hadford, nearly a generation ago, it was under something of a cloud: for some unknown reason, he abandoned his pregnant fiancé, Alice (Elizabeth Boag) on the church steps the day they were to be wed. Alice is now the town’s mayor and married to Derek (Russell Dixon), a builder, and it should come as no surprise that she’s not particularly pleased with the fact that Murray has returned. Somewhat more surprising, perhaps, is the fact that Brad (Stephen Billington), who is now married to Kara (Charlotte Harwood), isn’t especially glad that Murray has returned either. Indeed, if it were up to Alice and Brad (and probably Derek as well), the town would give Murray a welcoming parade and then an even more enthusiastic literal sendoff to anywhere else. The play is rife with plots and sub-plots. Is Murray really the hero he’s been made out to be? Why did he really leave Alice on the church steps? How long will Kara put up with Brad’s disparaging treatment and, if she ever does feel she’s had enough. What will she do about it? What, if anything, does Brad’s obsession with guns portend? Or his obsessive competitiveness with other men and his cavalier attitude toward the truth? The cast of Hero’s Welcome consists of the same three men and two women who comprised the ensemble cast of Confusions, with the addition of Evelyn Hoskins who truly steals the show as Baba. To be sure, Richard Stacey, who played some of the lesser roles in Confusions truly comes into his own here in the starring role of Murray. Nor is this to to say that the other members of the cast aren’t just as good here as they were in Confusions for they truly are. It is just that Evelyn Hoskins is so refreshingly delightful as Baba that one tends to forget just how talented the other members of this cast really are. 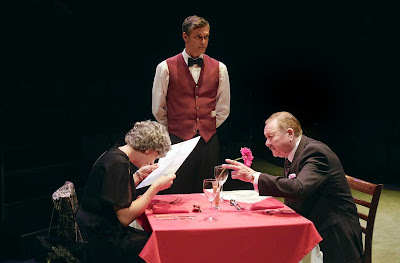 L-R: Elizabeth Boag, Stephen Billington and Russell Dixon in CONFUSIONS. Photo by Tony Bartholomew. Alan Ayckbourn is an enormously talented and prolific playwright with 79 plays to his credit who frequently focuses in his work upon the seemingly eternal “battle between the sexes” - that apparently unending conflict between misogynistic, philandering and domineering males on one side and their often submissive and mistreated female partners (who, nonetheless, often are the ones to have the last laugh) on the other. It was in1974 that he wrote Confusions, a series of five separate one act plays interconnected in having a character in each of the first three appear in the next play on the program. Their interconnectedness was further enhanced by the fact that all five related, in one way or another, to that “battle between the sexes” and to the fact that they were performed by an ensemble cast of just three men and two women playing 20 different challenging roles. Confusions was first produced at the Library Theatre in Scarborough in 1974 and had its London premiere in 1976 at the Apollo Theatre. Now, forty years later, it is finally receiving its long overdue New York premiere as part of this year’s Brits Off Broadway program at 59E59 Theaters on East 59th Street in midtown Manhattan. It’s been a long time to wait but I must say that this outstanding production by the Stephen Joseph Theatre of Scarborough was well worth waiting for. In Mother Figure, the first of the five plays on the program, Lucy (Elizabeth Boag) is the first of Ayckbourn’s mistreated women to appear. Her husband, Harry, a traveling salesman, is on the road , as he usually is, having little interest in his family, and she is left to tend to their home and three children herself. Nor is she doing a very good job of it as both she and her home become increasingly disheveled to the point that she doesn’t bother to change out of her nightclothes during the day nor even answer the phone when it rings. Lucy’s neighbor, Rosemary (Charlotte Harwood), is herself mistreated by her male chauvinistic husband Terry (Stephen Billington), and when they check in on her to see how she is doing, she is rather non-plussed. Lacking adult companionship, her knowledge of how to deal with adults in an adult manner has atrophied and she treats them the only way she knows how: as if they, too, were children. And yet it works and it is Lucy and Rosemary, not Terry, who prevail. Terry not only drinks his milk (albeit reluctantly) as a well-behaved child should but also apologizes to Rosemary for his earlier disparaging behavior toward her. Score one for the ladies. In Drinking Companion, Harry (Richard Stacey), Lucy’s philandering traveling salesman husband (who we heard about but never actually got to meet in Mother Figure) is attempting heavy-handedly to seduce Paula (Charlotte Harwood) and/or Bernice (Elizabeth Boag), either or both of the two younger women he has encountered in his hotel’s bar. He doesn’t get very far and the only beneficiary of his behavior would appear to be the waiter (Stephen Billington) who serves round after round of drinks to the three of them and who Harry tips somewhat more extravagantly as he becomes increasingly intoxicated. Score two for the ladies. The same waiter whom we met in Drinking Companions is there again in Between Mouthfuls but this time he is working in the hotel’s restaurant rather than in its bar and is serving dinner to two couples seated at two different tables. Mr. and Mrs. Pearce (Russell Dixon and Elizabeth Boag) are seated at one table, blissfully unaware of Polly (Charlotte Harwood) and Martin (Richard Stacey) seated at the other. Polly and Martin saw the Pearces as soon as they entered the restaurant, however, and, if it were up to Polly, she would have left on the spot. But Martin, who is employed by Mr. Pearce, refuses to leave, fearful that it would damage his career if Mr. Pearce were to have seen him and might then have suspected that he chose to leave the restaurant in order to to avoid his boss. As the waiter serves first one table and then the other, we become privy to their respective conversations. Mrs. Pearce, it seems, suspects that her husband has been having an affair but does not know with whom. Martin is focused solely on his career at the expense of his marriage which causes Polly considerable distress. We learn, too, that the relationship between these two couples goes well beyond Martin’s employment by Mr. Pearce. Mrs. Pearce shows up again in Gosforth’s Fete, this time as the town councilor scheduled to deliver a speech launching the building of a new village hall. Gosforth (Russell Dixon), megaphone in hand, is overseeing the afternoon festival which is being held on his land and is supervising the organization of the accompanying tea in the tea tent by Milly (Charlotte Harwood). The vicar Richard Stacey) is also in attendance but apparently even his divine connections can’t prevent everything that could possibly go wrong from going wrong. The sound system isn’t working and Gosforth is having his hands full trying to fix it. When he finally does, the consequences of its working turn out to be worse than its not functioning at all as announcements relating to matters that might better have remained concealed are inadvertently revealed to all and sundry. And then, when the sound system is functioning, it is the tap on the tea urn that jams which ends up scalding the vicar, flooding the amplifiers, and literally shocking (and potentially electrocuting) more than one participant at the fete. Meanwhile, a troop of cub scouts at the fair have become virtually unmanageable, even by their scoutmaster Stewart (Stephen Billington) who is (or at least had been) engaged to marry Milly before all hell broke loose. As Stewart seeks solace in drink, thunderstorms roll in, hastily built platforms and stages collapse, and the fair devolves into utter chaos. It all makes for a very funny slapstick scene that marks the comedic high point of the show. Everybody loses in this one (except the audience which wins big). It all might have ended there on that exuberant note – but it doesn’t. There is still one play to go, A Talk in the Park, which differs significantly from the other four. For starters, none of the five characters in this play – Arthur (Russell Dixon), Beryl (Elizabeth Boag), Charles (Richard Stacey), Doreen (Charlotte Harwood) and Ernest (Stephen billington) – appeared or were even alluded to in any of the other four plays and, perhaps even more telling, none of them seems to have any real connection to any of the others in this play either. They are just five strangers seated on park benches, each attempting to avoid unwanted contact with one of the others while seeing nothing wrong in attempting to regale a third with his or her own tale of woe. It is a sad commentary of the degree to which individuals are taken with the importance of their own lives and assume that everyone else should be interested in them as well while taking little or no interest in the lives of others. Because A Talk in the Park is so different from the other four plays, some critics over the years have contended that it should not have been included in the Confusions program, that the other four plays would have sufficed and that, had it been omitted, it would have led to audiences leaving the theater in an even more cheerful mood. I don’t agree. I’m not only delighted that Ayckbourn saw fit to include A Talk in the Park in the program but I actually consider it the best of the five plays, the one that is the most thought-provoking, and the one that leads us to reassess the other four in a different light. The five person ensemble cast of Confusions is absolutely brilliant with each of the five cast members called upon to play anywhere from three to five diametrically different roles. Elizabeth Boag’s transition from Lucy, a virtually abandoned wife in Mother Figure to Bernice, a tough younger woman whom her philandering husband is seeking unsuccesfully to bed in Drinking Companions, is truly remarkable. Her further transitions into the haughty Mrs. Pearce in Between Mouthfuls and Gosforth’s Fete and finally into Beryl, a battered woman, in A Talk in the Park are equally delicious. Charlotte Harwood has proven herself to be similarly versatile. As Rosemary in Mother Figure and again as Polly in Between Mouthfuls, she effectively plays the role of the unappreciated wife; as Paula in Drinking Companion she succeeds in fending off the unwanted advances of someone else’s philandering husband; as Milly in Gosforth’s Fete, she’s affianced to a Dudley Do-Right-type character but even he doesn’t know all there is to know about her (at least not right away). And by the time she evolves into Doreen, a seemingly mildly paranoid older woman in A Talk in the Sun, she’s virtually come full circle. Stephen Billington, too, appears in all five plays: as the ubiquitous waiter in Drinking Companion and Between Mouthfuls; as the demeaning husband, Terry, in Mother Figure; as the Dudley Do-Right-type cub scout leader in Gosforth’s Fete; and, ultimately, as the unhappily married Ernest in A Talk in the Park. He is effective across the board. Richard Stacey appears in four of the five plays but the range of characters he portrays is as broad as that of any of the other cast members. He is Harry, the sleazy philandering traveling salesman in Drinking Companion and Martin, the self-centered husband, in Between Mouthfuls, only to emerge as the vicar in Gosforth’s Fete. By the time we get to A Talk in the Park, he has morphed into Charles, a self-proclaimed victim of misfortunes not of his own making. Finally, Russell Dixon appears in just three of the five plays but his roles are the juiciest of all and he plays them for all they are worth. As the pompous Mr. Pearce, he dominates the scene in Between Mouthfuls, only to do himself even one better in his antic portrayal of the buffoonish Gosforth in Gosforth’s Fete. And I daresay that of the five bench sitters in A Talk in the Park, it is the lecherous Arthur, played by Dixon, who is likely to remain with you the longest.